And look how cute she is! I can't take credit for that, but the T-shirt looks good too! This T-shirt is from a range of customised baby T-shirts I produced under the mini-label 'Hey Baby'. 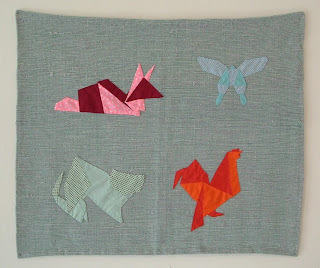 Each one is unique, and although they were really fiddly to sew, I really enjoyed it and was very proud of the results. The aim was to sell them on my stall at the Backyard market that I attempted last year. I sold a couple, but now I just sell them to friends whenever someone they know pops out a sprog. I've still got a few left, so hurry up people (Emma! ), get making them bambinos! Many thanks to Jack and Leroy for these fab images! Jewellery. It's powerful stuff. It can turn an outfit, a whole look even, from ok to AMAZING. A normal girl into an incredible-looking being. In my opinion anyway. This piece is made from plastic and looks like lace. 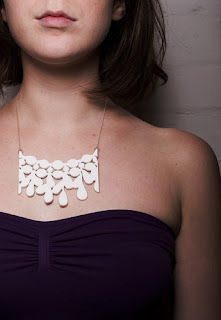 It reminds me of some fantastic laser-cut leather necklaces I covetted recently. It would make a really plain black garment look fantastic. 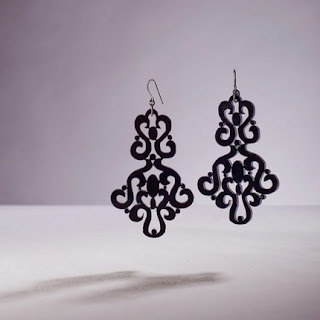 These beautiful chandelier earrings are by the same designer. I love their simplicity. No fussy beading, just great silhouettes. 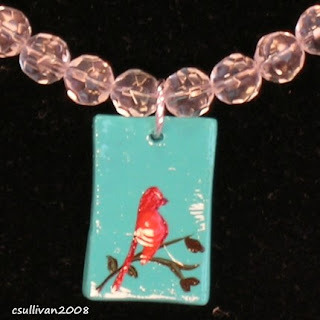 This pretty rose necklace would be great for the daytime. I think I'd wear this if I had a floral print garment on. My obsession with bird images knows no bounds! I like how this is slightly childish, but not too kiddie. Another day necklace I reckon. 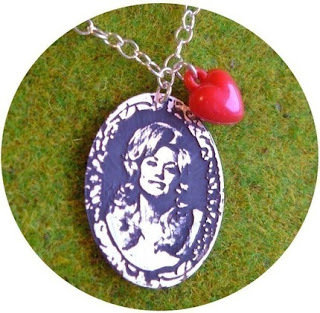 Dolly Parton tribute necklace! That's a fantastic concept! These days I try to steer clear of overtly kitsch jewellery, clothing and accessories (part of the inevitable 'growing up' process I guess), but I think this is just about on the border of what I would still wear. So what's your favourite? Do you have any personal jewellery rules that help you make selections? Once upon a time there lived a pair of vintage 60's curtains that Zoe bought for £4 in a charity shop... Well, to cut a long story short, I have finally finished making my new jacket! AND... It looks superb with my super-cute knitted hat that was created by my fabulous friend Michelle. Have I told you how super-talented she is yet? These colours are totally fitting in with my new colour scheme I'm working on which I'll explain more about in the future. 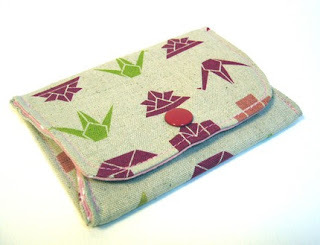 It's a beautiful handmade purse that was allegedly available for purchase on etsy (a site which sells allsorts of hand crafted gifts, jewellery and clothing usually made by independent designers/makers) however the link failed to work on this site where I found it and a search proved fruitless. But it looks lovely, and totally reminds me of the kind of thing my friend Michelle would adore. So crazy-talented is she! Oh, and I think I found that purse on a blog through a blog that Michelle recommended, so that kind of brings it full circle doesn't it?! Knitwear, the final frontier. Well it is for me anyway. I can't really knit, or crochet, or sew with knit fabrics. I just can't really get my head around these practices, though they are all totally on my 'Things to work out when I'm older' list, right alongside 'going out and enjoying myself without achieving a stinking hangover the next day' and 'how to stay living in a property longer than 12 months'. I digress. Subsequently, I am, at present unable and unwilling to create my own knitwear, and seeing as I'm on the Wardrobe Refashion pledge not to buy any new clothes this leaves me at the peril of second-hand knitwear finds. To be honest I have never been very successful hunting out desirable second hand knitwear in charity shops, and to fulfill such needs without breaking my pledge I have, to date relied on knitwear hand-me-downs from my mum, ebay and even the lost-property box at work (shh!). So when I found this website through a link someone had posted on the infamous Wardrode Refashion site, I was super impressed and inspired. What a wicked way to create fantastic, unique knitwear by recycling old garments, without being at the mercy of the sourced garments existing shape! I really love her use of buttons. I'm always super-jealous of people who can pull off embellishment with such simplicity and class. I tend to avoid embellishment, and let the shape of whatever I'm making and the fabric used carry the design, but I need to get on board! Ahoy!